Delaware Arts Info: Fringe Wilmo Gets Frightening Every Weekend in October! Fringe Wilmo Gets Frightening Every Weekend in October! 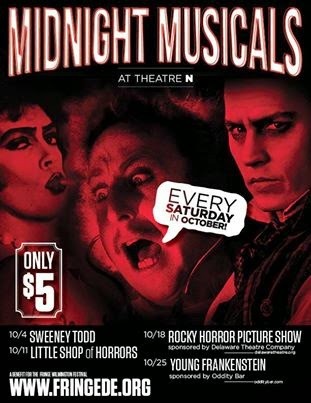 Join WILMINGTON FRINGE FANS every Saturday night in October for Midnight Musicals at Theatre N at Nemours to support the Fringe Wilmington festival. Admission is only $5! Sing-a-alongs, themed cocktails, giveaways, props, local actors, 50/50 raffle and more! Costumes strongly encouraged. Oddity Bar hosts a pre-game party before each main event, from 9:00-11:00pm. The Fringe Wilmington Festival is a five-day celebration of unconventional and experimental art held three times annually as Live Fringe, Film Fringe and Visual Fringe. 2014 Live Fringe Wilmington Festival runs November 19-23, 2014. Live Fringe presents Delaware’s most outrageous and edgy live performances by local, regional and national artists. Improv, dance, comedy, clowns, magic, drama, musical theater and the indescribable can be experienced in local theaters, vacant storefronts and unexpected spaces. The Live Fringe Preview Party kicks-off the festival with three-minute “samples” by each of the performing artists at World Café Live at the Queen.